Posted on Wed, Mar 2, 2011 : 3:21 p.m. The scaffolding is down, the sign is up and Ann Arbor's latest chain drugstore is on track to open this month with a new look for part of a historic downtown block. 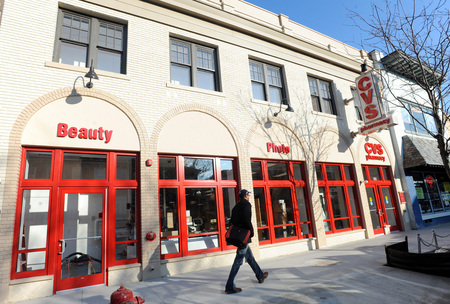 CVS is finalizing the interior of its store at 209-211 S. State St. on the edge of the University of Michigan campus. That work follows months of construction, which included equipment staging in the street outside the store. The new look for the historic facade on South State Street. CVS officials said the store is scheduled to open March 20, about 10 months after the development team purchased the 0.15-acre property on the east side of the street between Washington and Liberty. That land deal followed city approvals for the store that came in fall 2009. The $8 million project preserved the historic facade but demolished two houses behind it. New construction followed to create the 13,040-square-foot store over two levels behind the facade. Other recent openings on the street include 7-Eleven and Five Guys Burgers and Fries. Thu, Mar 3, 2011 : 3:03 a.m. I lived in a dorm as well as apartments as a college student. When I showed up at the term's onset I had enuf toothpaste, dental floss, shampoo, deodarant, bandaids in a little tote. always had plenty..the daily concern was getting to the library, not finding the Drug Store....What is this on State St for?....sugary snacks probably. Thu, Mar 3, 2011 : 8:39 p.m.
That's great you're so organized but many other people aren't. Thu, Mar 3, 2011 : 2:01 a.m.
Amazing to me that projects like CVS, Liberty Lofts, Zingermans, and numerous others are carried out in historic districts with great success, yet our mayor continues to describe historic districts as zones where no development can ever take place. If only the mayor and the council majority would fully embrace what most residents, visitors to Ann Arbor, and experts in urban planning already know: historic districts are authentic and desirable places that people are attracted to for living, shopping and working. The charm of Ann Arbor is its historic downtown buildings, its old neighborhoods, and the architectural wonder, new and old, of the UM campus. CVS shows that chain stores can and will work within local restrictions--even historic districts--when they see an opportunity to be successful. We see this in cities all over the country. There's no need to sell our souls to attract businesses and appropriate developments to Ann Arbor, and there is no reason to view historic districts as frozen time capsules. Just look how wildly successful historic Main Street and the blocks around it have become. Historic preservation is good business. Thu, Mar 3, 2011 : 1:24 a.m. Apparently the red word between Beauty and CVS is Photo. The last drugstore I remember in that downtown area was named Lucky Drug, and I learned of it asking downtown employees if there were any drugstores in the vicinity. CVS might not sell Gold Emblem juices or spices downtown, without competitors nearby. RiteAid sells its own brand of spices, and both chains occasionally sell seasonings for under a dollar. It would be a good thing for this new CVS to offer ExtraCare cards to its patrons, like suburban CVS stores do. Fri, Mar 4, 2011 : 3:16 a.m.
Thu, Mar 3, 2011 : 12:32 a.m.
Reserving judgement until we see what they do with the windows: block them all up with tacky posters, or let people see in? Wed, Mar 2, 2011 : 9:49 p.m. I'm glad they put up that vertically oriented sign that sticks out from the building. Somehow, that's more visually appealing to me than a flat, boxy sign that hangs flush against the building (see the new 7-11 down the street). Good job, CVS. Thanks for caring enough to preserve some of downtown's history and character. Wed, Mar 2, 2011 : 9:41 p.m. I'll be interested to see if it is as empty as the 7-11 on State. That store hardly has any aisles/merchandise. Many drug stores carry pop, food, etc. It will be interesting to see if this one will as well or stick to toothbrushes, hairbrushes, cheap perfume, make-up, etc. Wed, Mar 2, 2011 : 9:26 p.m. Very impressed with the look, looks awesome! Wed, Mar 2, 2011 : 9:22 p.m.
Hopefully they will have a film mini-lab operating there, too. Wed, Mar 2, 2011 : 9:18 p.m.
That part of Ann Arbor has desperately needed a drug store for a long time, but especially now as a result of so many students at North Quad. And the non-students who live in the near downtown area can just walk to CVS, thereby saving on fuel!